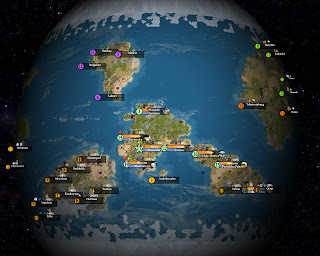 Being new to the Civ franchise, it did not seem implausible that if I started a game at 11 o'clock I would be able to play a quick hour and then walk away. I had heard rumors of the "one more turn" momentum that the game engenders, but I did not expect to sit down for a quck taste and not look up again until 1:30am, or that at that point I would actually tell myself "one more turn" and continue playing for another forty-five minutes. It is a brilliant game. The snappy pacing and the sense of accomplishment given by every building, wonder and research you complete combine to make it absolutely irresistable to simply dabble. You're tired? Well the people of Osaka are sick and overcrowded. You've got school in the morning? Well they just found oil outside of Kyoto and the English are crowding in on your western colony. What are you gonna do about that, huh? Salvage your nightly sleep, or Rule the World? I trust you'll make the right decision.